We have all received those emails, an official looking letter from a foreign dignitary, full of typos and grammatical errors, promising you millions of dollars but only if you are able to help them with a fund transfer. This is 419, a form of advance fee fraud. Nigeria is infamous for this type of scam, in fact the number "419" refers to the article of the Nigerian Criminal Code dealing with fraud. 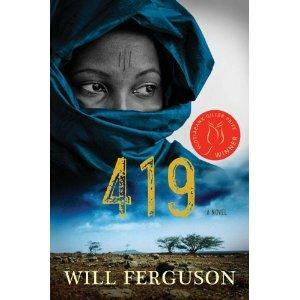 Will Ferguson has written a thought-provoking and rather sad novel about the effects of 419, by introducing characters from around the world (mainly Canada and Nigeria) whose lives are all unalterably changed by a 419 scam. This book, which won the 2012 Scotiabank Giller Prize, wears many hats. It is a mystery, a thriller, and an overall social commentary on modern society. The reader is drawn in by the multiple story lines, involving characters from first-world and third-world nations, which Ferguson converges together at the suspenseful ending. As I first began to read the novel, I struggled to connect the seemingly random storylines until the ending, where it all came together. Ferguson has a gift of storytelling and is able to juxtapose Nigeria, a country of colonial mistreatment and a duplicitous oil history, to life in Calgary. I think that this book is worth the read, for anyone with interest in internet scamming or environmental law. The novel is very interesting and hard to put down, but leaves the reader with a sense of helplessness over the mistreatment of vulnerables by scam artists and the plight of Nigeria. You almost sympathize for the "villains" because you gain an understanding of why so many turn to 419 as a means to get by.